For 2019, Suzuki has made a number of updates to the venerable and nearly identical KingQuad 750 and 500 adding the most significant round of updates since the addition of power steering in 2009. Suzuki, the company that was first on four-wheels, decided it was time to breathe some new life into their full-size 4×4 models. For 2019, Suzuki has made a number of updates to the venerable and nearly identical KingQuad 750 and 500 adding the most significant round of updates since the addition of power steering in 2009. 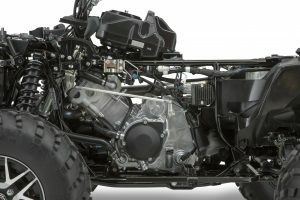 Complementing updated styling, Suzuki has made a number of changes to the ATVs looking to enhance their overall performance and durability, while seemingly making minimal changes in the production process in their Rome, Georgia facility where the KingQuads are manufactured, helping keep price in check. Offering more performance for the dollar than any other in ATVing, it’s no wonder that the full-size, mid-bore 4×4 segment is so popular among enthusiasts and highly contested by manufacturers. The updated 2019 Suzuki KingQuad 500 means that things in that segment have been shaken up a bit. 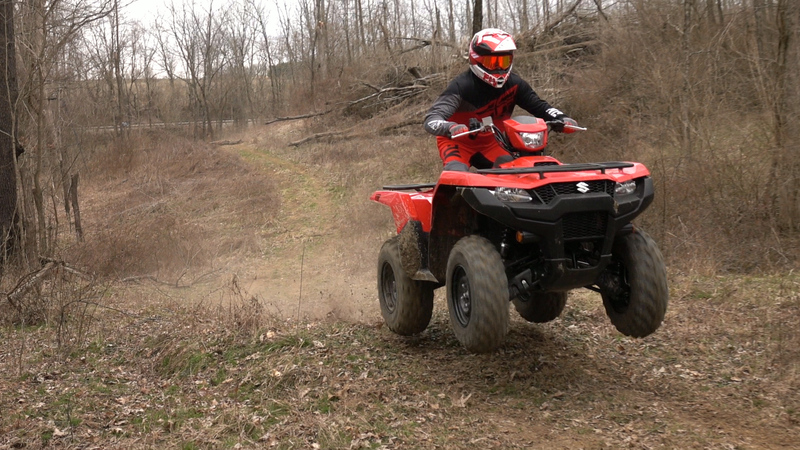 With experience testing the overall, mildly-improved, 2019 KingQuad 750 a few months back, we felt it mandatory that we put the updated KingQuad 500 to the test. 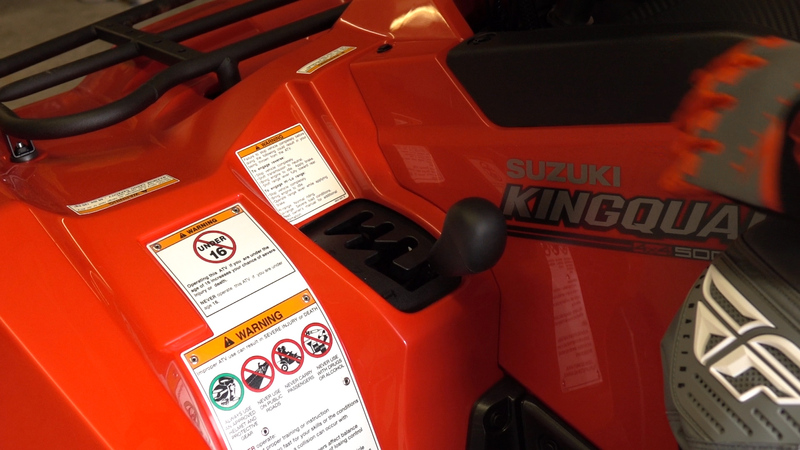 Suzuki is offering the KingQuad 500AXI, with a non-power steering model starting at $7,499. The 500 Power Steering we’re testing goes for $8,699. Other power steering models include camo at $9,099. The white SE model adds cast aluminum wheels and retails for $8,899 and the SE+ models add painted bodywork for $9,299. 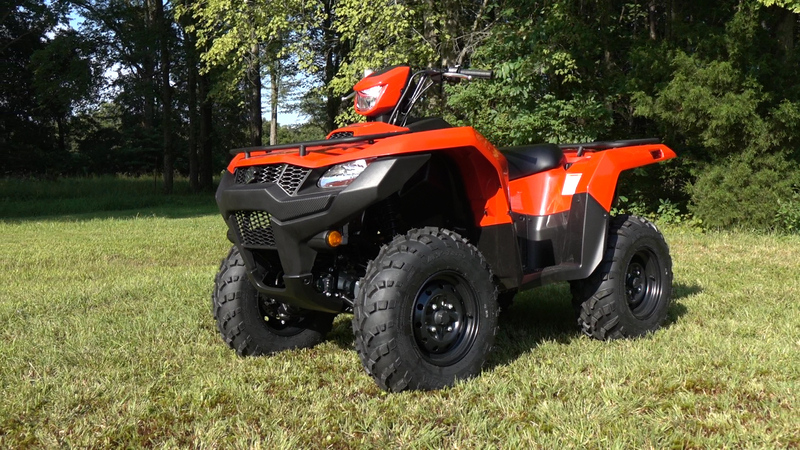 The KingQuad 500 non-power steering model retails for $7,499. The top of the line SE+ models add painted bodywork along with cast aluminum rims for $9,299. The 500 is powered by a 493cc, four-valve, SOHC, liquid-cooled, fuel injected engine. The 500’s cylinder is canted forward, reducing engine height for a lower seat height and center of gravity. The chassis, suspension, braking and other components are shared among the 500 and 750. The 500’s slightly simpler engine design is where Suzuki saves some money for the consumer. The 500 is powered by a 493cc, four-valve, SOHC, liquid-cooled, fuel injected engine, vs a more complex DOHC setup on the 750. The compact four-valve design is said to use large intake valves and straight intake parts for cylinder charging efficiency with an engine claimed to have been tuned with a wide power band with strong top-end power. The 500’s cylinder is canted forward, reducing engine height for a lower seat height and center of gravity. The lightweight aluminum cylinder is coated with Suzuki Composite Electrochemical Material said to improve heat transfer and improve piston ring sealing for improved combustion chamber efficiency. A counterbalance is used to reduce vibration. For 2019, the 500’s engine received minor fuel mapping changes primarily to remain EPA compliant. Suzuki has also installed special gas caps on the California models to meet the state’s strict fuel evaporation standards. A fully automatic CVT transmission features high and low ranges, with neutral and reverse selected by a smooth operating gated shifter. A fully automatic CVT transmission features high and low ranges, with neutral and reverse selected by a smooth operating gated shifter. A slick push button and lever combo on the right side of the handlebars allows you to select between 2WD, 4WD, and 4WD with the front differential locked. The 500 fires up quickly and is ready to go in short order. Vibration levels emitted by the engine are pretty low. The 500’s transmission takes advantage of a little more RPM to make up for its 229cc reduction in size compared to the 750. Rolling on the gas, the CVT engagement is smooth, but seems to happen at a slightly higher RPM than its bigger brother; then, it holds on longer before upshifting. It does well at keeping the engine in the heart of the power. Whether you’re towing or trail riding, the 500’s engine pulls hardest in the midrange. There’s adequate power to conquer almost any incline you’ll encounter on a typical trail system with plenty of thrust for most short, punchy climbs. That translates into good times racing corner to corner. It’s not a great slider, but that has more to do with the tires than the power. On long straightaways, the 500 has no issue getting up to and maintaining speed, building RPM’s well for a single-cylinder sport/utility machine. The 500’s engine pulls hardest in the midrange. There’s adequate power to conquer almost any incline you’ll encounter on a typical trail system with plenty of thrust for most short, punchy climbs. The engine is equally happy working, casually cruising, or heading out for a brisk ride. The clutching and overall engine calibration provides smooth, usable power. While the 500 doesn’t leave a bunch of excessive power on the table, it has all you need for general riding or working up to its recommended limitations. On long straightaways, the 500 has no issue getting up to and maintaining speed, building RPM’s well for a single-cylinder sport/utility machine. The thickness of the mainframe tubes have been increased from 1.6 to 2mm and mounting brackets for the suspension and final drive cases were reinforced. While the frame’s geometry remains unchanged, Suzuki made a number of updates to increase strength, rigidity, and towing capacity. The thickness of the mainframe tubes have been increased from 1.6 to 2mm and mounting brackets for the suspension and final drive cases were reinforced. 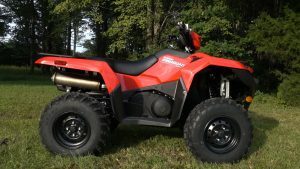 The KingQuad’s rear ball mount has been replaced by a 2” hitch receiver, which along with the reinforced frame, allows for the 330 pound increase in towing capacity to 1323 lbs. 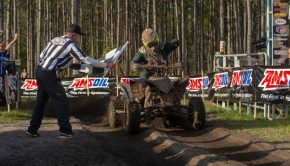 Riders have complained of over-steering on previous models that could make the machine a handful on rough downhills or in rough terrain at high speeds. This was far more pronounced on non-power steering equipped models. 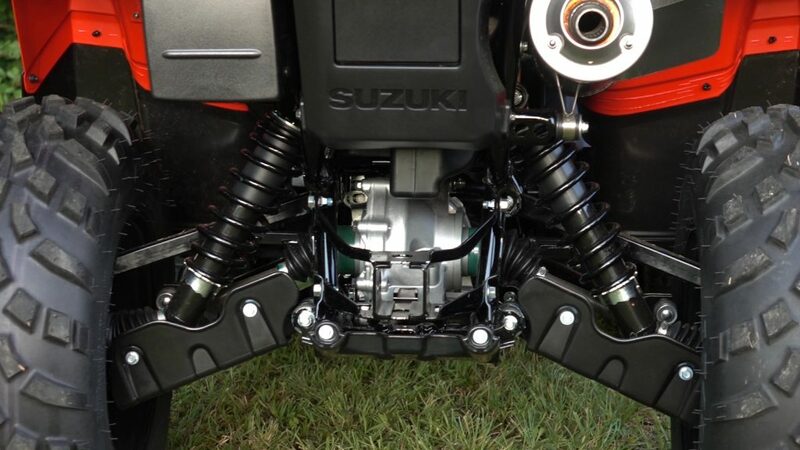 For 2019, Suzuki says, “The base steering characteristics are now tuned for an under-steer condition.” They worked to accomplish this with shock and sway bar updates. New gas-charged shocks feature larger shock bodies and five-way preload adjustment all around. The fronts received revised damping settings for improved control. The suspension geometry remains the same with dual A-Arms up front delivering 6.7” of travel and dual arm rear suspension providing 7.7” of travel, which are conservative numbers these days. New gas-charged shocks feature larger shock bodies and five-way preload adjustment all around. The fronts received revised damping settings for improved control. A 2” hitch receiver, which along with the reinforced frame, allows for the 330 pound increase in towing capacity to 1323 lbs. 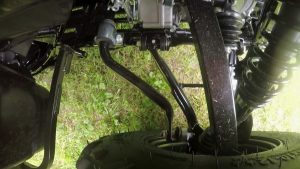 Suzuki utilized a larger diameter rear sway bar with a different shape to increase rigidity. Suzuki utilized a larger diameter rear sway bar with a different shape to increase rigidity. Softer sway bar bushings were used to reduce shock transmission into the chassis. To further improve control, Suzuki increased the power steering’s electrical power output by 40% in search of lighter steering and reduced bump feedback. Rolling on 25×8-12 front and 25×10-12 rear Carlisle tires, the KingQuad is a claimed 47.8” wide with a 50.6” wheelbase, 36.2” seat height, and 10.2” of ground clearance putting its size somewhere in the middle of the class. A claimed curb weight of 714 pounds is respectably light for a full-size, mid-bore 4×4. The updated chassis and suspension retain what was good about the KingQuad’s handling. At slow to intermediate speeds, its quick, agile handling lets you bob and weave through tight sections of trail. Steering is pretty light in 2wd becoming a bit stiffer in limited slip 4wd, and even more so with the differential lock engaged. We feel it could benefit from a bit more power steering assistance in 4wd although steering was by no means difficult. 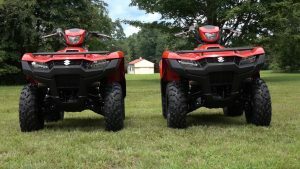 Honestly, we couldn’t tell much difference between the 2018 and 2019 EPS performance, although EPS adds a lot to the KingQuad’s handling, rider control, and will definitely reduce fatigue. 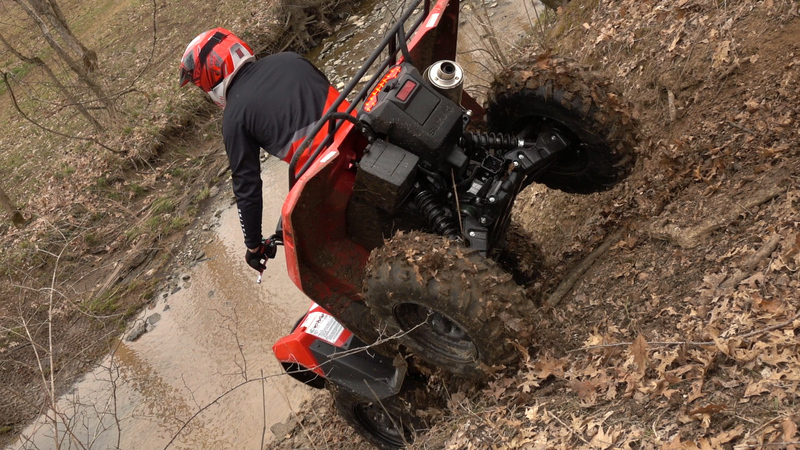 If you’re considering a KingQuad, we strongly recommend going with a power steering equipped model. 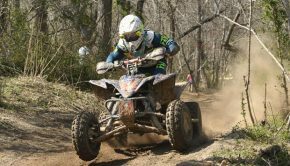 The revised shocks and stiffer sway bar result in a mildly calmer KingQuad when things get rowdy without much sacrifice in ride quality at lower speeds. The revised shocks and stiffer sway bar result in a mildly calmer KingQuad when things get rowdy without much sacrifice in ride quality at lower speeds. The shocks are similar to their older counterparts when it comes to eating up small trail junk. Although, after more time with the updated suspension, we feel the front shocks are a bit firmer than years past over bumps of all sizes. On big g-outs and jump landings, the new shocks don’t bottom as easily and seem a bit more composed under hard braking and on downhills. When speeds pick up, both rear tires remain better planted in corners, with a bit less body-roll entering turns and on off-camber, descents thanks to the new rear sway bar and new front suspension settings. 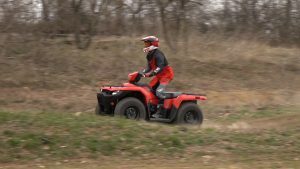 The KingQuad’s handling is well matched to its intended use of hard work or trail riding with just a bit more predictability when getting aggressive. The new shocks don’t bottom as easily and seem a bit more composed under hard braking and on downhills. Braking has been updated for 2019. The dual hydraulic front disc brakes received new pads, and the lever and line were optimized for better feel. The low maintenance, sealed, multi-disc, rear brake received a revised lever ratio for improved feel and overall performance. The front brakes offered good power and feel through the lever. The rear brake can be locked up, but still lacks the positive feel of standard disc brakes. While performance remains very similar to last year, braking power is adequate. While braking performance remains very similar to last year, braking power is adequate. 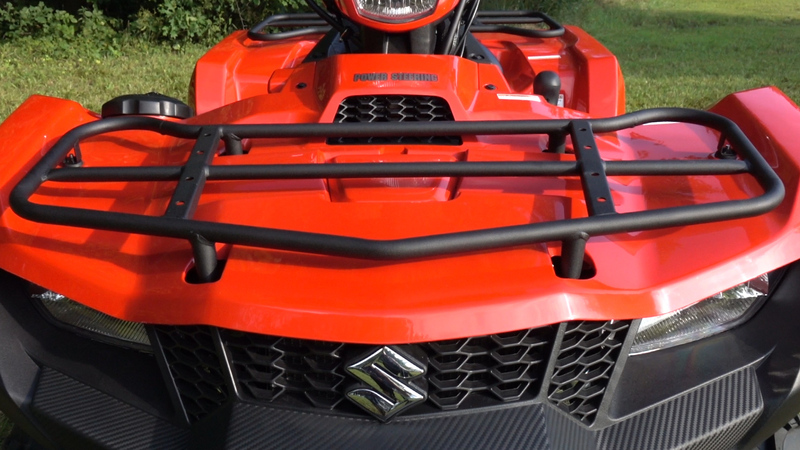 Suzuki utilized a taller handlebar, putting the rider in a more relaxed, up-right position. We found the new bar height comfortable and easy to work with. To complement its revised power steering, Suzuki utilized a taller handlebar, putting the rider in a more relaxed, up-right position. We found the new bar height comfortable and easy to work with. We’ve always been big fans of Suzuki’s plush, easy to move around on, T-shaped seat. Their floorboard and tall footpeg combination is the best in the business ergonomically with plenty of room to pivot your foot on the peg in rough terrain, even with a little mud build up. The rear brake pedal height is also right where it should be. Steel racks are still the best design in the industry, in our opinion, when it comes to securing cargo, without as much need to buy expensive accessories, and they don’t crack in cold temperatures. Steel racks are still the best design in the industry, in our opinion, when it comes to securing cargo, without as much need to buy expensive accessories, and they don’t crack in cold temperatures. The KingQuad’s racks feature a wrinkle black paint finish and are rated to haul 66lb front and 132lb rear. The KingQuad’s work capabilities have been taken up a notch for 2019 with the new hitch receiver’s 330lb increase in towing capacity to 1323lbs. 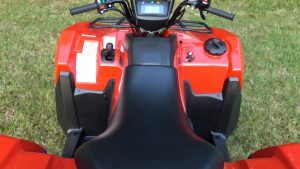 A new, rear mounted, centrally mounted, 4.0 liter storage box sits adjacent to the left side mounted 4.0 liter storage box, in addition to the 2.8 liter water-resistant storage box located on the right, front fender. The KingQuad 500 delivers all the power most will ever need for work or play. 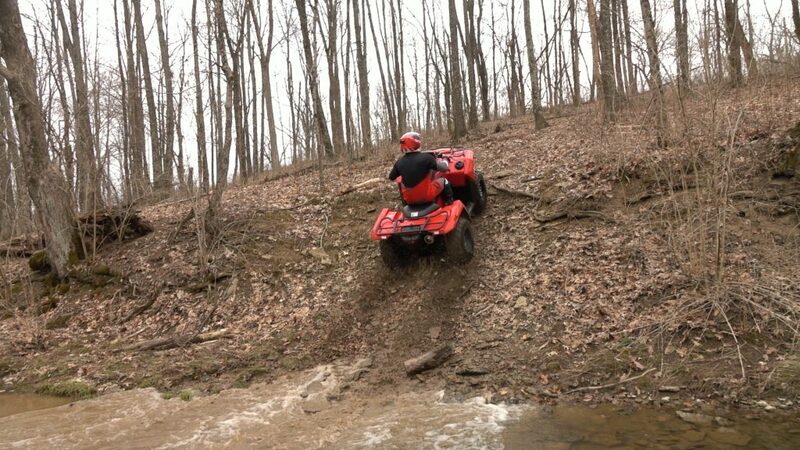 Its engine has all of the power needed to easily reach its towing rating and it delivers good fun out on the trail. Accompanying the new styling is the return of the handlebar mounted headlight. A revised digital instrument display now features a programmable service interval reminder. Easing maintenance, Suzuki made changes to the bodywork back in 2016 adding easier access to the oil fill point and dipstick. For 2019, the electronic panel under the seat can be easily removed in under a minute, providing easy access to the fuel filter. Accompanying the new styling is the return of the handlebar mounted headlight. 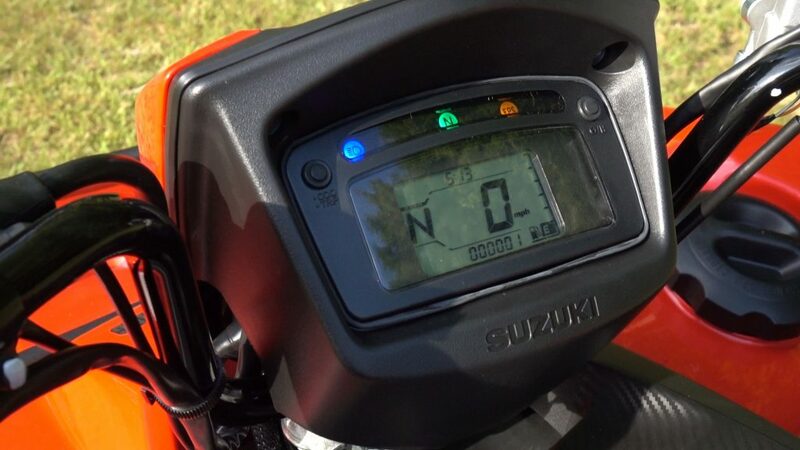 A revised digital instrument display now features a programmable service interval reminder. 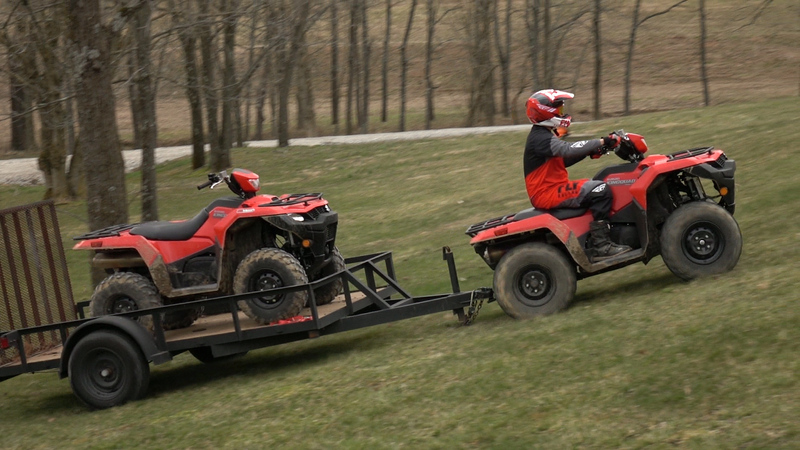 The toughest part for us in choosing the KingQuad 500 would be knowing that the KingQuad 750 costs only $1,000 more. 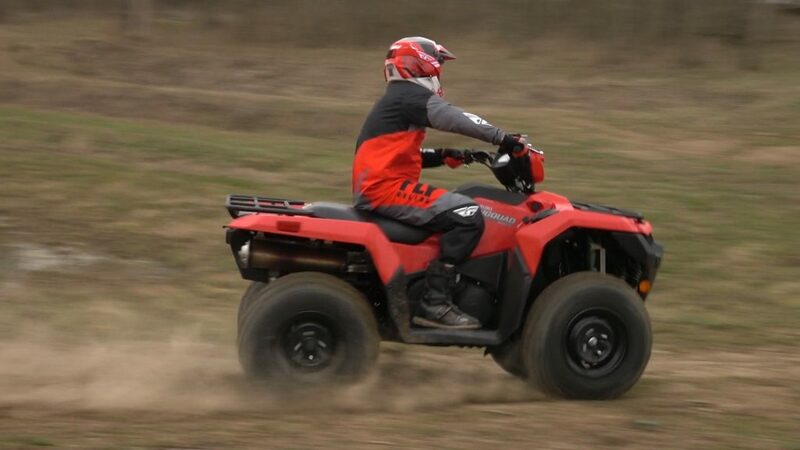 The KingQuad 500 delivers all the power most will ever need for work or play. Its engine has all of the power needed to easily reach its towing rating and it delivers good fun out on the trail. The beefed up frame should result in a tougher machine for years of hard work or play. The 500 gets the nod for delivering a small, but noticeable, improvement in handling predictability and suspension performance while retaining an agile, nimble feeling. Competitively priced, the KingQuad 750 stands out as the largest displacement, big-bore, single-cylinder 4×4 on the market. In spite of its solid performance, the 500 doesn’t have any one feature that really makes it stand out aside from having one of the most expensive retail prices in its class. However, the KingQuad is built mostly in the USA. 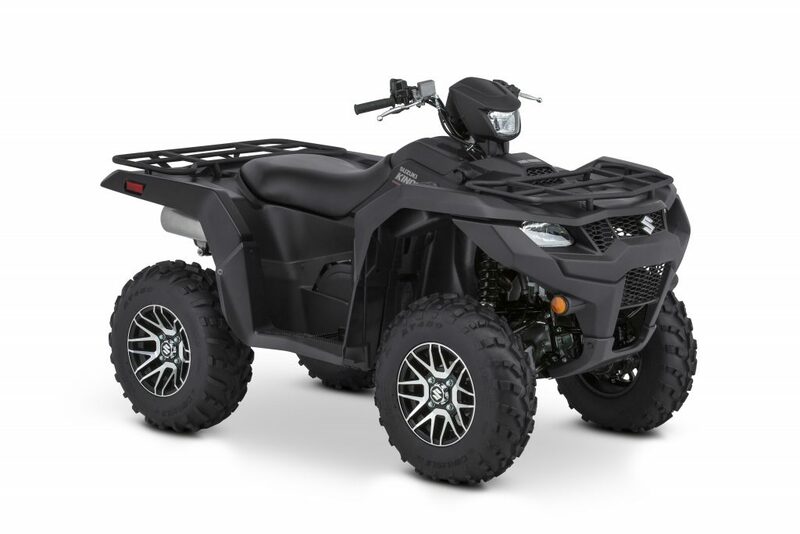 It comes with an impressive 1-year warranty, offers years of refinement, and attention to detail that the Japanese manufacturers are known for; all good reason for considering the updated 2019 Suzuki KingQuad 500. If you have a solid local Suzuki dealer to back you up if needed like we do, that’s good, too. 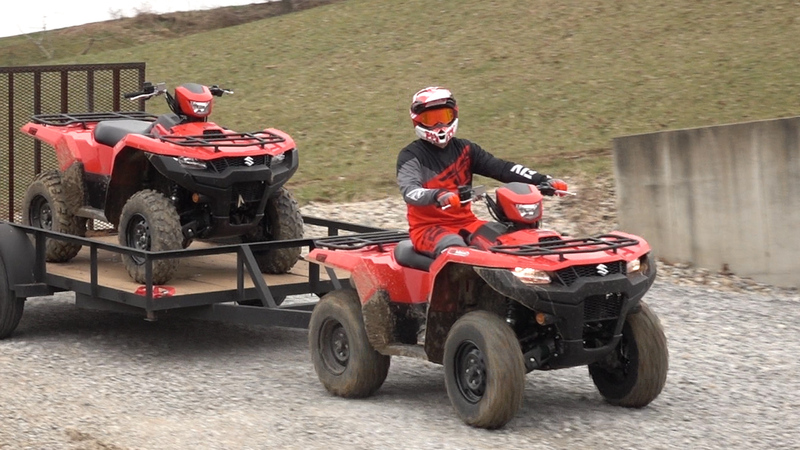 The toughest part for us in choosing the KingQuad 500 would be knowing that the KingQuad 750 costs only $1,000 more. For this reason, we will be putting the 500 and 750 head to head very soon to see how their difference in performance stacks up against their difference in price. Subscribe and you won’t miss it. the KingQuad is built mostly in the USA. 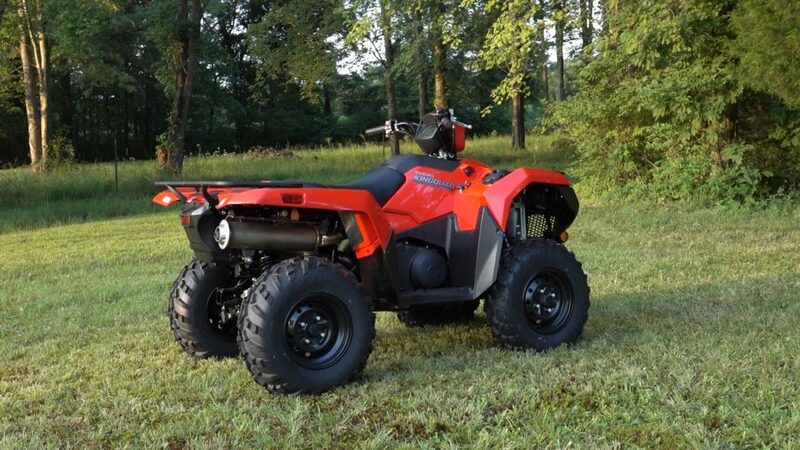 It comes with an impressive 1-year warranty, offers years of refinement, and attention to detail that the Japanese manufacturers are known for; all good reason for considering the updated 2019 Suzuki KingQuad 500. 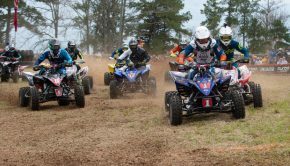 For more information on the 2019 Suzuki KingQuad 500AXI Power Steering of Suzuki’s full line of ATVs and motorcycles, log onto suzukicycles.com. Summary: the 500 doesn’t have any one feature that really makes it stand out aside from having one of the most expensive retail prices in its class. However, the KingQuad is built mostly in the USA. It comes with an impressive 1-year warranty, offers years of refinement, and attention to detail that the Japanese manufacturers are known for; all good reason for considering the updated 2019 Suzuki KingQuad 500.